Please note that only 64 bit OS is supported by Skype for Linux edition. Snap is a Linux app packaging format developed by Canonical, the company behind Ubuntu. It aims to solve the fragmentation problem of Linux package format. This means developers only need to package the software once and it will run on all Linux distributions that supports Snap, like Debian, Ubuntu, Linux Mint, Arch Linux, Fedora, OpenSUSE and even OpenWRT. Snap enables developers to push software update quickly to end users. Snap also allows you to easily downgrade a package to a previous version if you ever desire to do so. Select Skype and click Install button. Installing software on Linux to a system folder requires root privilege, so you need to enter your password. Once the installation complete, you can lunch Skype from your application menu. For those who love command line, Skype can also be easily installed on Ubuntu 18.04 by issuing the following command. Open up a terminal window and run the following command to add Skype Linux client repository to your system. You will need to enter your password. Then use the following two commands to fetch and install Skype public key so that APT package manager can verify the integrity of downloaded packages from this repo. Since this repository is using HTTPS protocol, we also need to install the apt-transport-https package. Now all left to do is to update our software source and install skypeforlinux package, which is around 69 MB of size. Once installed, you can start Skype for Linux from application menu or use the command below. Once you are logged in, you can start using Skype. When a new Skype for Linux version comes out, simply run sudo apt update and sudo apt upgrade command to update to the latest version. Flathub is a software repository for flatpak packages. Flatpak is a Linux app package format similar to Snap. First we need to install the flatpak tool. Then add the Flathub repository. Next, install the Skype client. 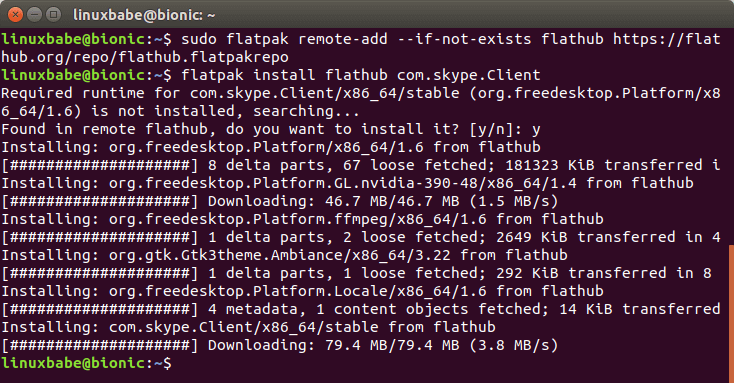 Note that sudo is not need to install Flatpak pacakges. Once installed, you can start Skype from application menu, or use the following command. I hope this tutorial helped you install Skype on Ubuntu 18.04 desktop. As always, if you found this post useful, then subscribe to our free newsletter to get more tips and tricks. Take care. I like this tutorial, thanks, but please don’t forget that it can be installed through the GUI as well. In my experience people new to Linux are often scared of Linux because they think that everything has to be done with commands through the terminal and when most websites are only showing how to do stuff through the terminal (because terminal is usually the same across desktops) it just makes that myth grow. So please remember to show GUI install also. Thanks! Hi Gustav, thanks for your suggestion. I just added instructions for installing Skype from GUI. 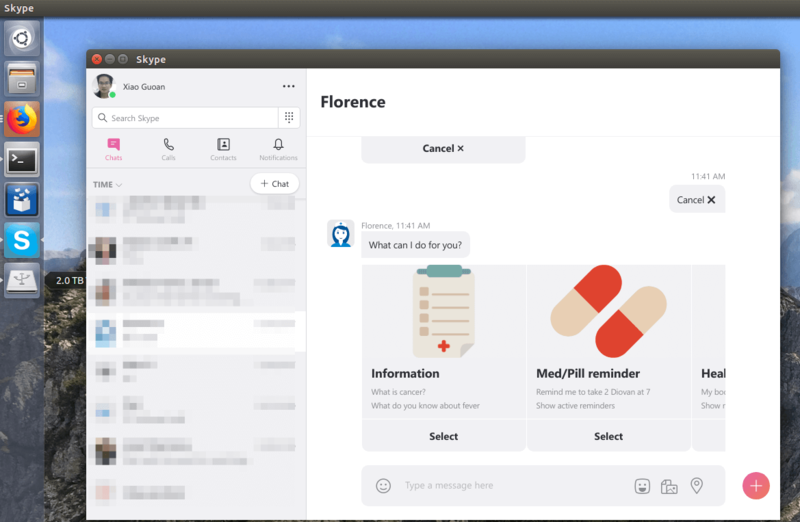 This is a great tutorial on how to install skype for ubuntu step by step. thank Xiao Guo-An a lot. Nice tutorial, very complete with the inclusion of the different flavours, snap and flatpack. Oh, and it does NOT help linux users further who would like to communicate with business partners that are using Skype for Business. I suppose what I try to highlight is that unfortunately the skypeforlinux package is far from matured, helpful, and maybe even desirable. There is an issue here. What if you’re running 18.04 on a 32 bit architecture? It seems that Skype is only made for 64 bit architecture? Yes, this Skype is only for 64 bit machines.